In summer 1983 six workers from the Stockport Messenger walked out in protest at the increasingly intimidating approach of the owner, Eddie Shah. Here, Father of the Chapel, Alan Royston, recalls the experiences of himself, Phil Daniels, Kevin Shervin, Stan Hart, John Noble and Neil McAllister. 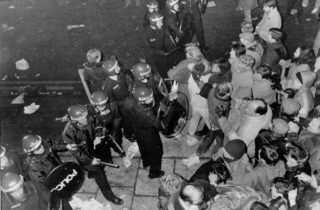 The dispute was one of the most significant of the 1980s, and a sign of things to come with the government clearly siding with the employer through the use of mass policing and the new ‘anti-union’ laws. In many ways it was a dress rehearsal for the subsequent Wapping dispute. What is a Father of the Chapel? The Father of the Chapel (FoC) is the equivalent of a shop steward or union rep. The print trade adopted this from the days when monasteries and religious orders were the sole source for recording the spoken word. A Chapel is the body of workers who are represented by their Father or Mother of the Chapel. Like all reps, responsibilities of the FoC are to give leadership and represent the Chapel on all manner of things, terms and conditions usually being the most common. How did the Stockport Messenger dispute start? Messenger Newspapers was owned by Eddie Shah, who had signed a recognition agreement with the National Graphical Association (NGA) for the Stockport production office. When he started the Bury Messenger he signed a separate recognition agreement but almost immediately started recruiting anti-union staff for the production of the paper in Bury. The situation in the Stockport office started to deteriorate shortly after. File copies of previous issues disappeared and there was an atmosphere of intimidation developing. The final straw came when an advert for our own jobs was placed in the paper. Agreement could not be reached with Shah and eventually we walked out in protest on July 4, 1983. What was the support for the picket from other unions and the local community? 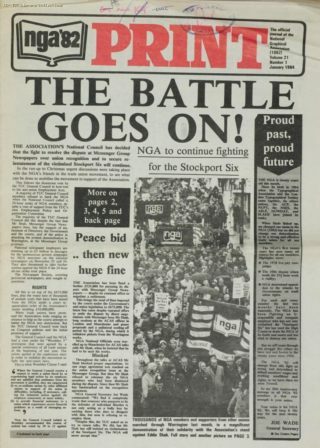 The ‘Six’ as we became known would picket Monday to Friday outside the Stockport Messenger office. Later, we were joined by six NUJ members of staff, who decided to support the NGA. They are often overlooked in this dispute but I applaud their bravery and solidarity. Trade unionists would travel from all over and those working locally would join us at lunch time. We had good support from the community and often found that businesses would show their support by not placing their advertisement in the paper. Was it a peaceful picket? The atmosphere in Stockport for the most part was peaceful. There was always a small police presence but nobody was ever arrested or warned and we even used to include them in the breakfast run. The atmosphere changed completely when picketing began at the Warrington print site. One night policing took on the feel of a military battleground. The Tactical Aid Group, which is a specialist unit that has undergone riot training, had been deployed and appeared to have been instructed to wade in. I believe this was politically motivated by Margaret Thatcher and the newspaper owners, who were intent on destroying any form of organised labour. How did the dispute end? The dispute didn’t come to an official end for us. The NGA had taken a terrible financial hit, the dispute had already lasted over 12 months and it was decided that if the ‘Six’ could be found work this would be the better alternative. Eventually all found work within the print trade, mainly in regional newspapers.